Invoice Template with Hours and Rate or Billing Format with Hours and Rate is a service billing format that calculates line totals from hours and hourly rate. 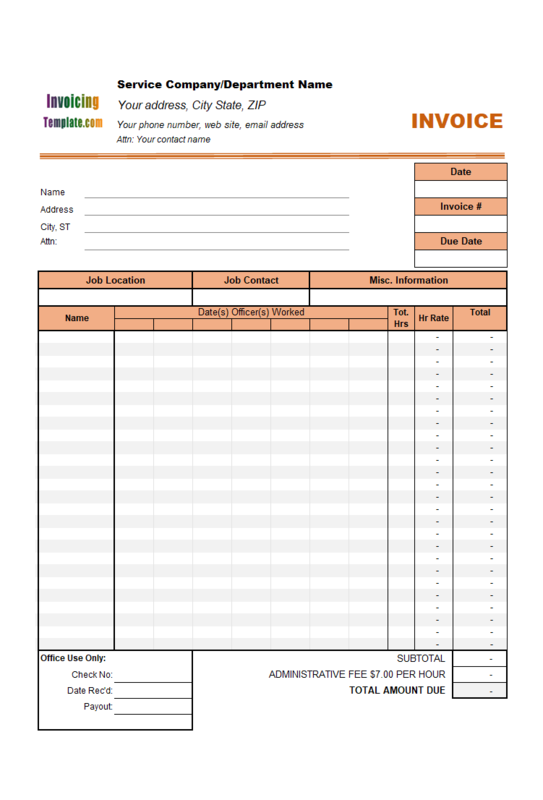 Based on c4025 Hourly Service Billing Format, this template offers a different look and feel by applying various Excel formatting options. 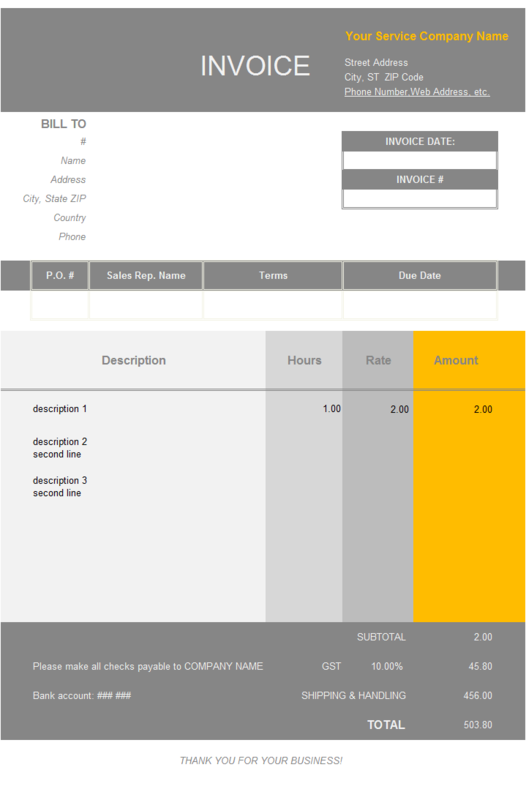 c4031 now includes the customized invoice template for the latest version of Invoice Manager for Excel. This is what you will see when you open hoursrate.xlsx. You know it is important to make a good impression when doing service or consulting business. Invoices are one of the chances to make your clients remember you. 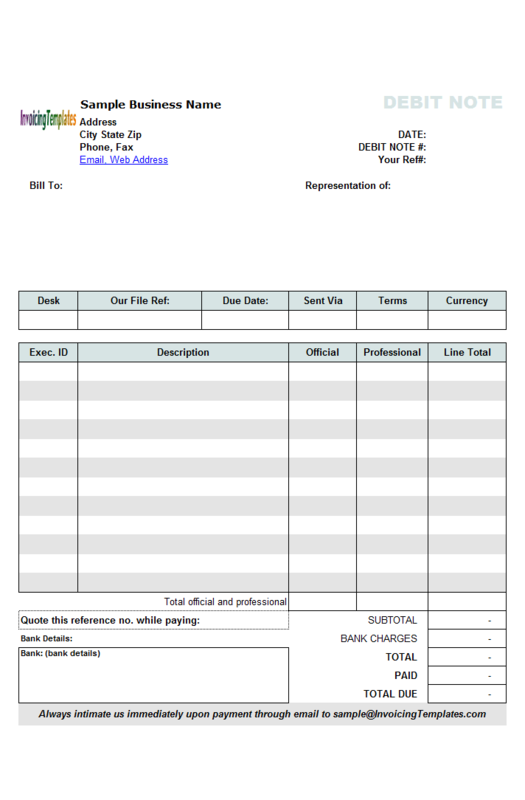 A professional and good-looking invoice also helps in collecting payments. 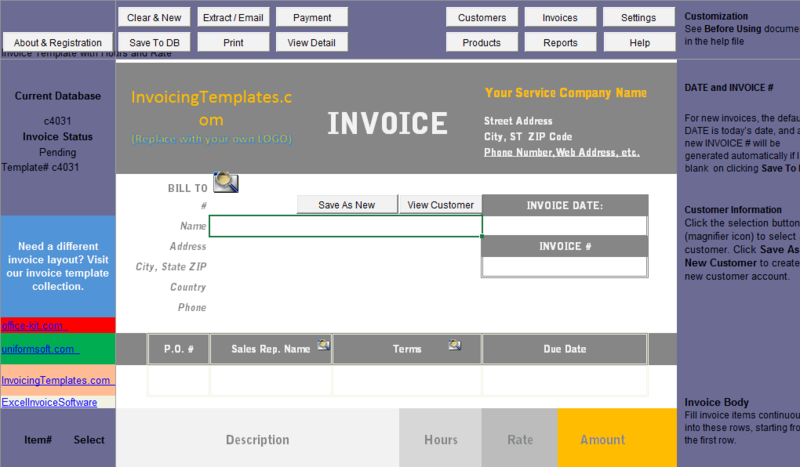 While we have already provided several service billing samples for hourly rate here on InvoicingTemplate.com, this new design offers a beautiful and professional layout then the others. 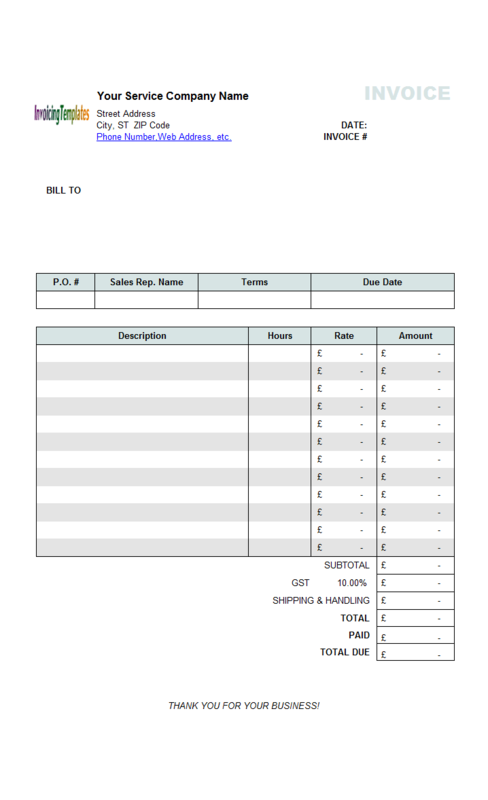 The basic Hourly Service Billing Sample, which is created from the default template included in Invoice Manager for Excel (namely Uniform Invoice Software), uses the same color schema as the original template. 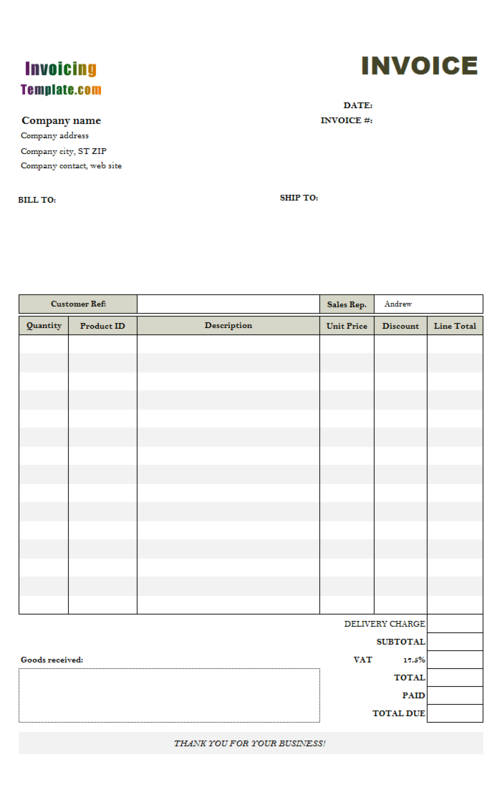 The original template works just fine, as both a free template, or when used with Invoice Manager for Excel (namely Uniform Invoice Software) as the front-end of a complete billing and invoicing system, some one might say that the original design is not attractive enough and is just a general design. Fortunately, Microsoft Excel offers comprehensive tools that you could use to customize the layout of the template. 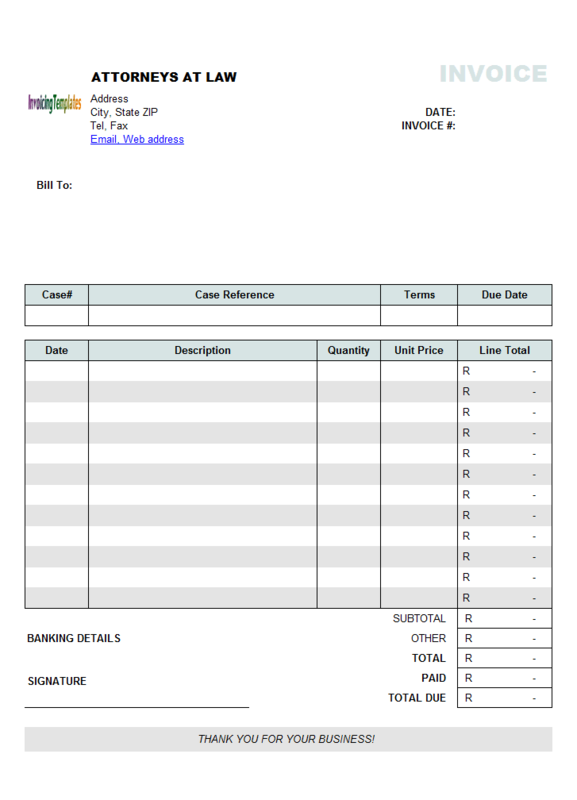 There are already several samples on customizing Hourly Service Billing Sample (c4025) here on InvoicingTemplate.com, including: c4026 Hourly Service Billing Sample (UK Currency), c5068 Hourly Service Billing Sample (Price Including Tax), c5069 Hourly Service Billing Sample (Price Excluding Tax), and c4027 Beautiful Service Billing Template with Hourly Rate. Two things to note about this spreadsheet. Firstly with this design we set all page margins to 0 (zero). Your print result may look slightly different if the printer you use does not support borderless printing. 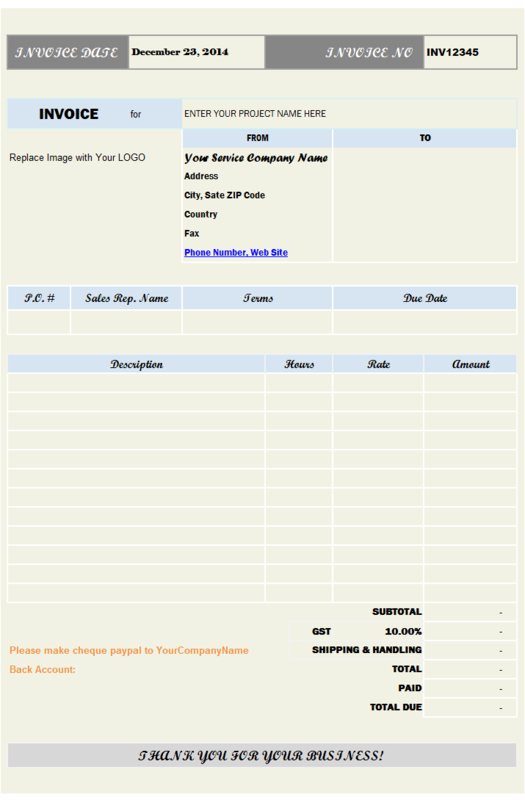 Secondly, the default logo image located on the top of the form is an Excel word art object, instead of an ActiveX image object as found on most templates here on InvoicingTemplate.com. To place your own logo image on the same place, you need to make your logo image with transparent background color, or simply use Excel word art to create one. 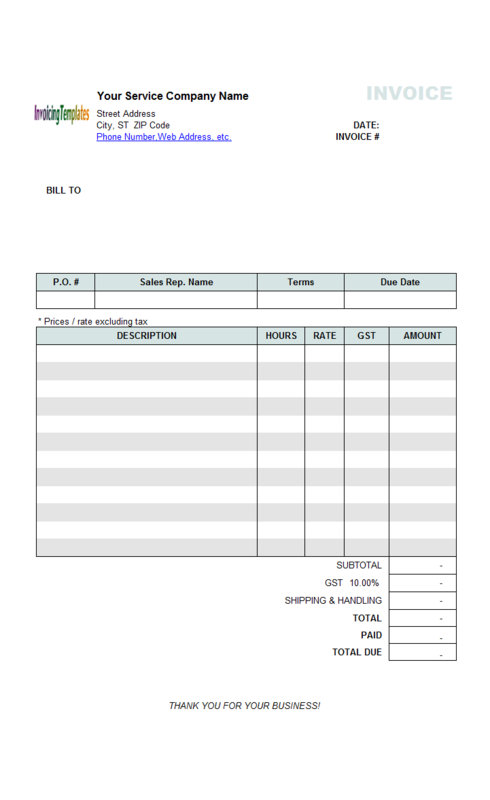 This template has one tax, GST, set on the bottom of this spreadsheet. There are in fact another tax line hide next to the GST line. If you need two taxes, hide the second tax line. 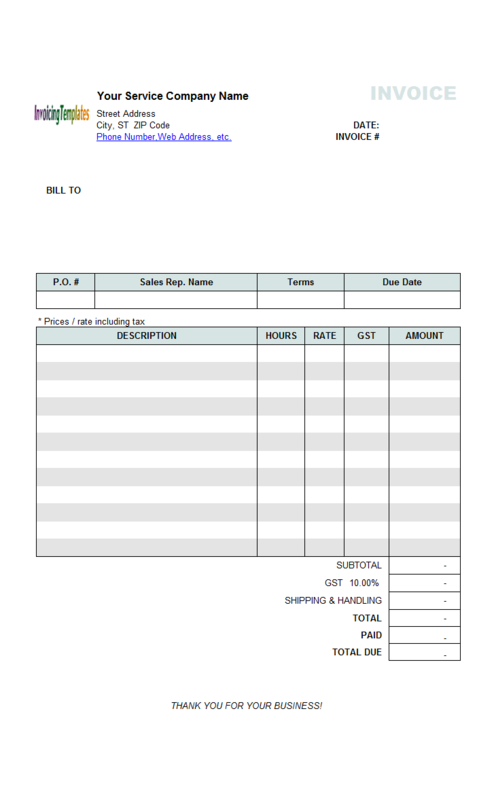 If you use the Invoice Manager for Excel (namely Uniform Invoice Software) edition, setting tax options can be done by clicking the Settings button on the Invoice worksheet, and then go to the Taxes tab. With the freeware edition, you should first unprotect the spreadsheet and then unhide second tax line manually. 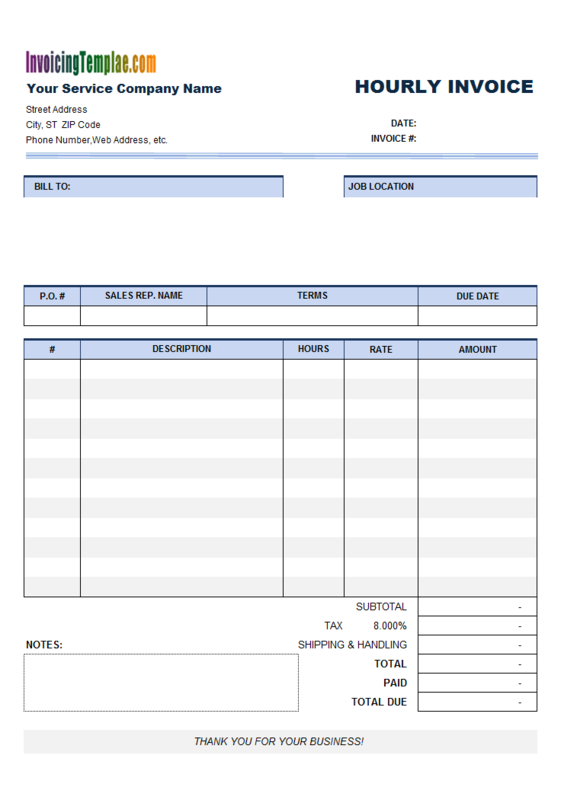 Like other form designs here on InvoicingTemplate.com, Billing Format with Hours and Rate is free (offered to you at a price of 0.00USD). It works on Windows XP and all newer versions of Windows, and Excel 2007, 2010, 2013 or 2016. Updated the template hoursrate.xlsx so that it has a modern look and feel.